When I awoke this morning it was beautifully sunny...but only 11 degrees Fahrenheit! Needless to say, it's still soup weather in Milwaukee! Here is a soup that is a tribute to spring with fresh asparagus but also a wonderfully warming soup if it's still chilly in your part of the world. 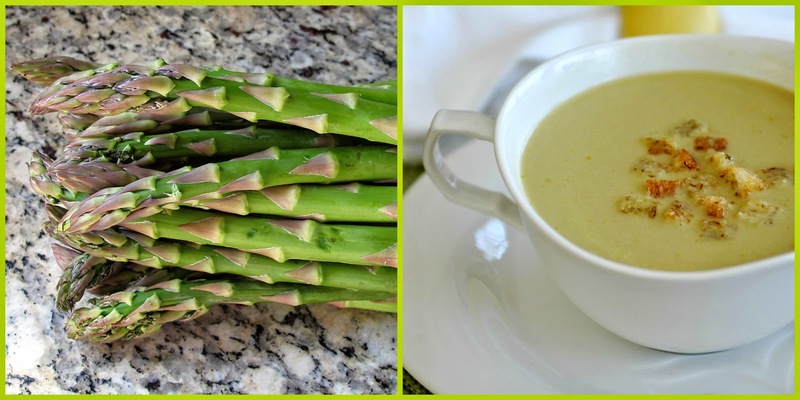 I've posted an asparagus soup recipe in the past but I think this one is even more delicious! I think it's because this one is flavored heavily with shallots, which I love. The soup is then garnished with saffron croutons which were so delicious I could have munched on them as a snack. I couldn't wait to scoop them out of their delicious and creamy asparagus-flavored bath. Both recipes are from Stir: Mixing it Up in the Italian Tradition by Barbara Lynch. One of my favorite cookbooks! I cut down on the heavy cream by a little over half to reduce some of the fat and I also used unsalted chicken stock rather than the water called for the recipe. Puree the soup in batches in a blender (or use an immersion blender as I did right in the stock pot). Pour the soup over a large, fine mesh strainer into a large, heat resistant bowl or another large sauce pan, pressing on the solids to remove as much liquid as possible. (I scraped everything that stuck to the bottom of the sieve into the pot). Discard the solids. Gently reheat the soup if serving warm. Stir in lemon juice (I did not use), and season to taste with additional salt and pepper. Top with croutons and optional chives and serve. Pass extra croutons at the table. 6 slices of bread, preferably brioche, (I used sliced French bread from my bakery), crusts removed. Heat the oven to 325F. Cut the bread into approximately 1/4 inch cubes. Heat the olive oil in a skillet over medium low heat. Add the saffron and gently cook for about 1-2 minutes to infuse the oil with the flavor and color of the saffron. Add the bread cubes, season with salt and toss to coat with the flavored oil. Spread the bread cubes on a baking sheet and toast in the oven, tossing occasionally, until crispy and golden, about 12 minutes. The baked croutons can be stored in an airtight container for a day or two. And how cute are your bowls? So true we eat with our eyes first.. I still use my 4 mini lion head bowls..
And the larger ones for many soups..how many dishes have we collected over the years? Yum! Would love to have a bowl of that for dinner tonight! Our warm temps took off for unknown parts also. Glad it is not as cold as it is where You are. Asparagus soup is lovely-especailly in the spring, and even it is only 11 degrees Brrr.I live in Florida and I cannot even imagine those temps. Sending Florida sunshine your way. Hi, your comfort soup sure look very inviting and awesome. It definitely nice to eat with French loaf. I love your soup bowl, very elegant. Just stumbled across your blog. Thanks for the recipe! Love the thought of saffron croutons! All the pictures of soups on the right side of this page are making me hungry! Thanks so much for stopping to comment, Gemma! Beautiful soup-love both the recipes! I am sending you some of our gorgeous Arizona Spring weather!! Arizona and Florida people, you're killing me :) Love Arizona by the way! Susan, you have me at saffron croutons!! The soup must be very delicious! 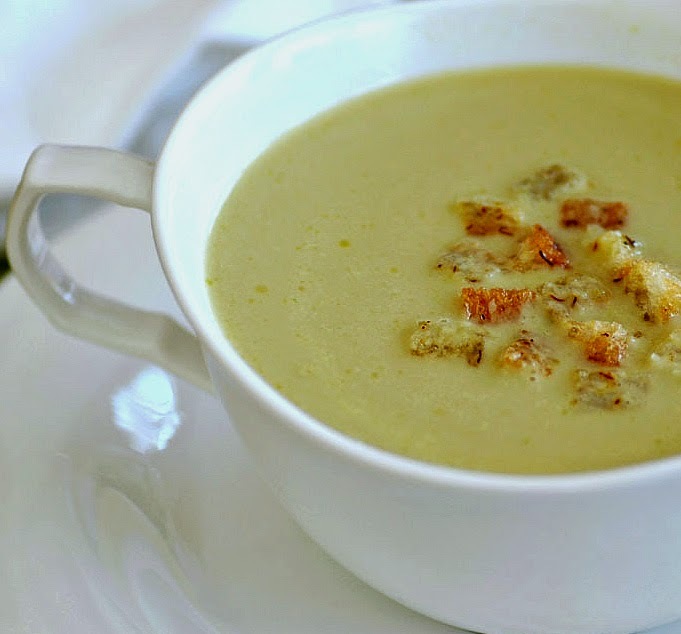 Your Creamy Asparagus Soup with Saffron Croutons is looking beautiful. I'm sure it taste just as great. hm...Asparagus=Spring, no? Never mind. But they do remind me of Spring. :) I wish the temperature here is a bit cooler....it kind of feels like summer already and I really miss Spring! It's still winter here as well and so windy. Tuesday I posted a spring-like dish hoping the weather would be warmer but yesterday made chili because it was so bitterly cold. I love soups especially when it's cold out but always forget about asparagus soup. Your soup looks creamy and delicious as do the croutons. I may have to whip up a batch before the week is over. What beautiful & creamy soup Susan! I'd have to up the quantity of those saffron croutons :) Love your beautiful bowl~ I hope spring arrives soon in your neck of the woods! Susan, what a beautiful presentation of the soup for the first day of Spring! Hopefully, it will start to warm up soon. That's right. A riddle wrapped up in an enigma, that would be me. At any rate, Susan, your soup looks so wonderfully-comforting, like a soft wool blanket! And I covet the pretty little bowl. In fact this soup is so pretty that I used it as the cover on my Pinterest Soup board. I do love asparagus soup, Sam. And using the saffron croutons is perfect. I agree...I never make enough croutons. People (and that includes me) keep taking them out of the container for snacks! MMM, love asparagus soup... but those croutons! I've been in such a crouton mood lately. I had tons of bread from a shoot and chopped them into croutons and froze them so I've been making them for a while to put on soup or salad instead of having bread on the side. LOVE saffron in them. As usual great recipe and photos. YOu make everything look so good!!! I love how this is the perfect mix of spring and winter! Those croutons are calling to me...I love the idea of saffron to give them a little extra pizazz. As much asparagus as we eat when ours is coming in, we've never done soup - this sounds very good. Thanks for all the comment love, people! Wow, Susan, this is a wonderful looking soup! It is still very chilly here (though not as cold as Milwaukee) and soup would be welcome. This soup looks to be a welcome one any time of the year! I love the saffron croutons! No Spring here either! They're predicting a snow storm this weekend. Dudan I love soups and this look delicious, I made a soup today too at home! Susan I wanna say Susan not Dudan oh my!"!! Im crazy today! Asparagus always says 'spring' to me. That soup sounds so good! I always look forward to asparagus season. With the weather so unseasonably cold it seems so far in the distance. I'll print this out and just have to wait patiently. I used to dislike asparagus because of their looks, isn't it silly? Now i love them and this soup is perfect for the last days of winter! That is a beautiful bowl of soup! Looks so delicious! And the croutons sounds wonderful! I hope Spring will be popping up soon! I am such a fan of the other Asparagus Soup that you posted and have made it many times. I will try this recipe the next time I make it. I checked at our local market but I only buy asparagus when they say made in the USA. Hopefully we will see those soon. Like Velva who lives in the same town as I do, I can't even imagine those temps that low for extended periods of time. We do have other weather issues that you wouldn't want such has some horrific thunder and lightening storms and we are expecting some of those tomorrow night. We had one earlier this week and it took out my sterio system. I was NOT a happy camper. Thanks for sharing this recipe and I will be trying this recipe soon. This is printing out as I type. I may even make it for Easter. And, when fresh asparagus appears in our farmers' markets, I'll just crank down the ac and make it again!! It is still soup weather here too although I see daffodils emerging and flowering trees are taking on a blush of pink. I always look forward to local asparagus and will love to try this soup. Saffron croutons are a very special touch. Still soup weather here also, with another 3" predicted for tomorrow! We love asparagus here, and this recipe is at the top of my "to do: list. 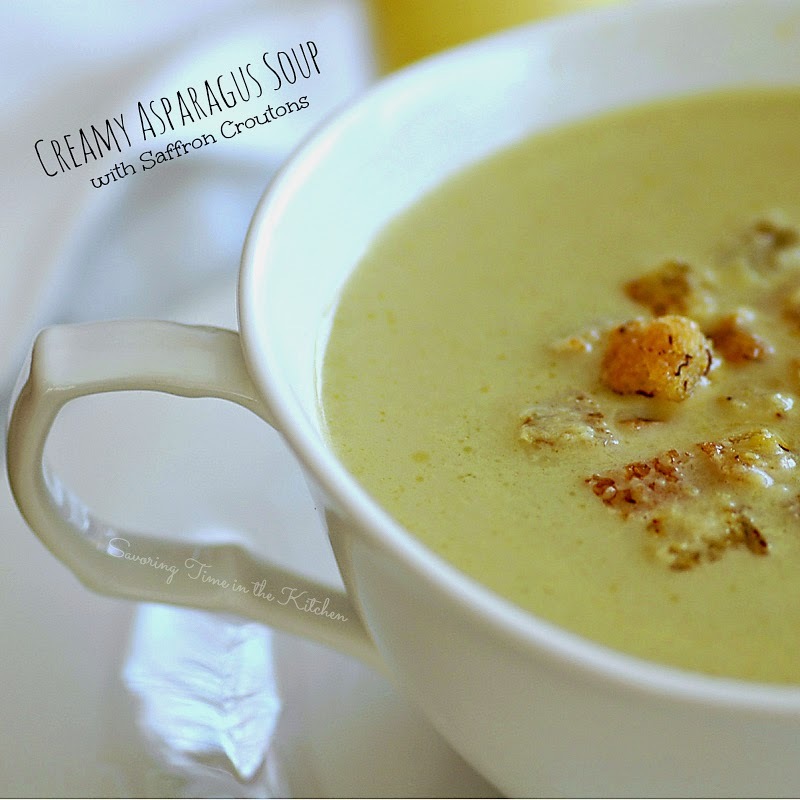 I've never made asparagus soup so this is great! Have a good weekend! This sounds wonderful - even though I live in the South, it's still quite chilly . I think it would be perfect all year round! Gorgeous pics and I really love your blog. Thought I'd pop over to say Happy Birthday to you and greetings from South Africa. I hope it works for you, Barbara! I just wish Blogger would do more about this problem too. Spring may arrive in April sometime but while I'm waiting your soup would be wonderful. It is still soup weather here too. But at least it is now asparagus season and we can enjoy it in soup. I love your recipe, thanks so much for sharing! Love this soup!! It's the same here. It's so sunny and looks so nice out... But then it's freezing! Beautiful presentation Susan, and I love the look of this soup...creamy and rich. 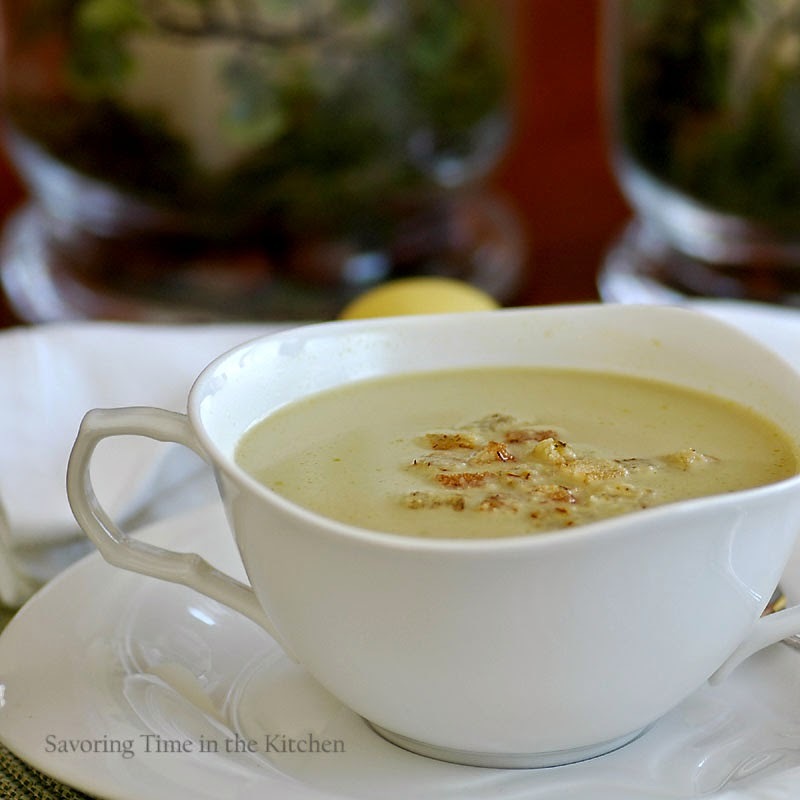 I love simple vegetable based soups like these and I'm with you on the use of shallots. Those saffron croutons sound like a perfect match. Your soup looks beautiful! Perfect picture. Sorry I am so late getting here! This soup must simply be amazing with the asparagus AND the addition of saffron -- the ultimate spice! So perfect for spring!! Printing RIGHT NOW! So glad to have found your delicious blog in order to follow along via email subscription. Please do stop by sometime when time permits to my new blog address.